Review – I should point out that given how Sherlock and Moriarty end up in the canon Holmes’ stories I’m VASTLY worried for how they will end up in Lock & Mori since I’m terribly invested in them as a couple (however Mori’s last sentence is NOT AT ALL comforting). So here’s the thing about this book – if the author had used any other names for the characters, I think there may have been issues with characterization. No matter what your feelings on Sherlock Holmes are (whether you like it, whether you have a favorite iteration, etc) pop culture has ingrained in us certain “Holmes” like personality quirks. His social ineptitude (whether from finding everyone else a complete dullard or just the price of genius depends on your favored version), his blunt way of speaking, his observational skills and lack of tact when stating those observations, his obsessiveness–these are all things anyone keyed into pop culture to some degree will know. Naming your character Sherlock Holmes (unironically I might add) and then grafting on some of those characteristics (somewhat modified to fit a teen boy instead of a grown man) subconsciously clues the reader in “Oh!”. Its a quick fix to keep from dragging on and on about characterization when you want your plot to move along (especially in a first person narrative). Moriarty is a bit more difficult as in the canon he’s a rather minor player in Sherlock’s stories. His effect isn’t minor (just as as Irene Adler’s effect isn’t minor), but his actual role/screen time is minimal. He’s expanded in various versions to be this great arch nemesis to Sherlock, pulling the strings on any number of plots and popping up as often as Watson in some cases, but who he is exactly isn’t a known quantity. So Petty had a larger task to flesh out Moriarty as a character (there’s not many cultural “aha!” clues beyond ITS SHERLOCK’S ENEMY because of the name). As I was reading–and let me stress I greatly enjoyed this book–the character balance felt uneven. Told from James “Mori” Moriarty’s point of view we see things from her perspective (yes she’s a girl named James, there’s a story to that). The world is colored by her expectations, her experiences, her belief. Whereas Sherlock (“Lock”) has a rather limited and sheltered expectation of the world, Mori’s been out in it and has been hurt by it in ways Lock doesn’t quite grasp and in all honesty may never be able to grasp. To him the police are the answer to her family issues. They may be utterly useless for a murder scene, but the issues Mori faces with her father can be–should be–solved by the police. After all how COULDN’T they be? But Mori knows (or thinks she understands) better. Mori is seeing things from recent experience–calling the cops about her father’s drunken rages, being dismissed, being overlooked. The only thing she cares about, the only thing that matters to her, is keeping her brothers together. In her way she’s being as naive as Lock is about the world. Her plan to take her brothers away somehow is built on a false positive–if the police are overlooking what their father is doing now, why would they believe her later? Mori’s motivations however are pretty self-evident throughout. 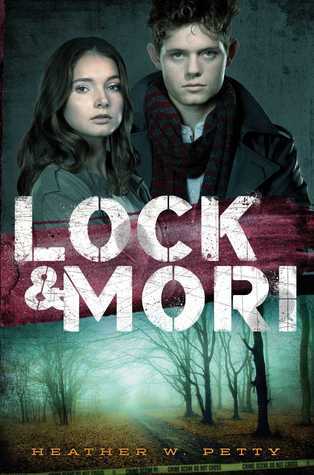 While it gets a bit jumbled at times (which makes sense to a degree–Mori is feeling conflicted and uncertain about everything, about what to tell Lock, how much not to tell him, what’s going on with her family, her mother’s death, the murders, her friendship with Sadie) Mori is VERY clear that her brothers are the priority. Lock’s is somewhat more murky. It becomes obvious he cares about Mori, but as Mori observes at one point–is she merely some new puzzle to him and that’s what intrigues him or does he truly understand what his actions mean? At one point Mori and Mycroft have a brief exchange in which he tells her that he won’t tolerate Sherlock being broken and Mori responds that maybe he isn’t the one who will be. Mycroft, who in the canon is even less acclimated to social niceties then Sherlock and here appears to be somewhat more normal at least, appears to consider her words carefully. The mystery itself, which becomes pretty obvious about halfway through, plays out in a chilling fashion. Mori’s inability to trust and Lock’s inability to understand clash in a hurtful way that has me excited for the next book almost as much as I am terrified.